So the new Kindle devices have just been announced, where you can now have another option to read late into the night without disturbing your already snoring partner. However, for those of us who still stick to traditional paperbacks and hardcovers, you would need to enlist the help of a bedside lamp. 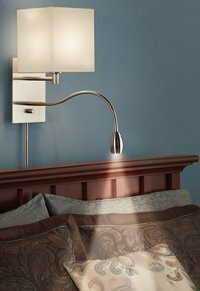 Some of the bedside lamps do not have that many lighting options, but not so for the $129.95 Brightness Zooming Bedside Lamp. The name itself does give the game away somewhat – this bedside lamp comes with an additional directional light which is capable of widening or narrowing its beam in order to deliver optimal illumination for reading. When you slide the supplemental lamp’s head, it intensifies its light from a diffused glow to a focused beam. Want to redirect the focused beam over to where you are able to get a better look? Use its flexible gooseneck and you have pinpoint control. The clear, white light hails from a 50,000-hour rated LED that makes it perfect for reading an irresistible page-turner. Of course, it is of not much help if the book you hold in your hands is a dozer.